Surely it is no wonder if Ireland feels like home to you. Signs proclaiming a hundred thousand welcomes are everywhere, greeting you like your grandmother’s embrace, a home-cooked meal, a warm fire and a cozy bed. A pot of strong tea served with fresh scones, strawberry jam and butter from the world’s most contented cows is sure to soothe even the most jangled travelers. And the fresh, organic produce from local farms will make you want to eat only meals prepared by one of Ireland’s masterful chefs. Yet more than dramatic landscapes, incredible food and genuine hospitality, Ireland exudes the feeling of a place your soul knows, perhaps better than anywhere you’ve ever been. Pronounce the island’s Gaelic name and you will understand. Éire (ay-rhe) must be voiced out on a gentle breath, tripped softly on the tongue, cradled in the mind and gathered back into the heart as a vow to return once more to somewhere so sacred you dare not speak it harshly or in haste. Souls recognize this place where mystery lives in ancient stones, in Celtic lore and stirring song. And in soul poetry that arises from deep communion with sights and sounds not entirely of this world. 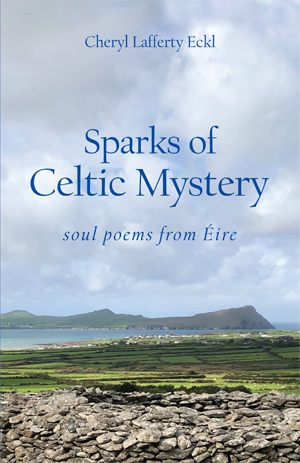 Come, pull up a chair and let yourself be gathered in to what mystical poetess Cheryl Lafferty Eckl saw and felt and heard as she gratefully answered Éire’s call. Click on the link below to order. Your local bookstore can also order through Ingram.